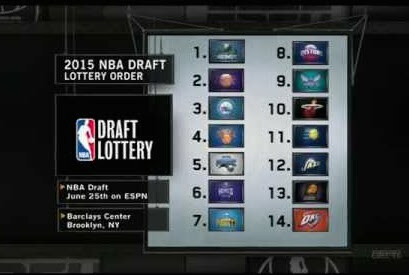 So the 2015 NBA Draft Lottery is over just like that, and no drastic changes to the draft order took place this year. There was no Cleveland or Chicago jumping nearly ten spots up to the No. 1 pick. The only change was a swap between the Los Angeles Lakers and New York Knicks for the No. 2 and 4 picks. Not the kind of Lottery drama you had in mind, was it Knick fans? Below is a quick look at the teams who will be selecting in the top 5 in this year’s NBA Draft. I am not really sure what to expect in this post, but hopefully I can share some insight on the teams’ needs, and how these selections will change their offseason approach when free agency starts in July. Full first round Mock Drafts will be coming soon, so stay tuned for those. For now, enjoy this de-briefing on the top 5 picks. The T-Wolves do something that has not been done since 2004; come away with the first pick after having the best odds to get it. Minnesota is now officially on the clock as they look to add another young piece to their core of young talent. The Timberwolves will almost definitely be deciding between the two premiere big men in this year’s draft: Kentucky’s Karl Anthony-Towns and Duke’s Jahlil Okafor. Whichever low post presence they choose will fit nicely next to their other young talent. Andrew Wiggins appears to be a player a team can build around, and Zach LaVine showed flashes last year of being a real talent in the league for years to come. Minnesota also has fromer No. 1 pick Anthony Bennett on their team, who I still think will develop into a solid player. The problem teams find with the Draft is that the majority of players are still so young when they are drafted. It is taking more time than it has in the past for teams to see what they have in a player. Other young talent on this team includes Gorgui Dien, Shabazz Muhammad and Adreian Payne (who they acquired from Atlanta last season). Throw in Ricky Rubio and the T-Wolves will leave the 2015 Draft with four legitimate players and a nice young nucleus of talent they can build around. Signing Okafor or Towns to play with Kobe, Randle, Clarkson and some good Free Agents will help the Lakers compete in the West! Well, Magic, the first part of your tweet isn’t that far off. It is true the Lakers will sign either Okafor or Towns to play with Kobe, Julius Randle and Jordan Clarkson. The “good free agents” and “compete in the West” is where you lose me. Besides Rajon Rondo, who the Lakers will probably overpay this summer when bidding against themselves, what other free agents could you possibly be convincing yourself are going to come to play for this current Lakers team? Cari Champion, host of ESPN’s First Take and Lakers fan, said on National Television the Lakers can look at Jimmy Butler, Kawhi Leonard or LaMarcus Aldridge. I hope she was kidding about all of them with the exception of maybe Aldridge. Leonard and Butler are restricted free agents, and all signs point to them staying with their current teams. As for Aldridge, why would he take less money and less years to play for a Lakers team that more than likely won’t make the playoffs next year when he could stay in Portland (getting paid more money over more years) or go to San Antonio or Dallas and actually “compete in the West” next season? As I wrote about yesterday, the Sixers could have came out of this draft with three top-11 picks. The Lakers and Miami Heat kept their lottery picks so the Sixers will select third. This franchise is the definition of “taking the best player available” as they have struggled to put together anything that even closely resembles an NBA team. With Okafor and Towns expected to be off the board this is where the draft will get very interesting. Trading back from this point throughout the first round become a real possibility, but assuming Philadelphia keeps their pick I think they will be deciding between the top two point guards in this year’s draft: Ohio State’s D’Angelo Russell and Emmanuel Mudiay. Haven’t heard of Mudiay? That’s because he played professionally overseas this past season after being recruited by Larry Brown at SMU. Whoever General Manager Sam Hinke chooses he will have found his replacement for Michael Carter-Williams, who he traded to Milwaukee at February’s trade deadline for a first round pick. The good news for Sixer fans is the team will have added another talented player with a high upside to their young core of players. Russell and his ability to shoot the ball and stretch the floor would fit nicely next to Nerlens Noel and Joel Embiid – who missed last season with an injury. The Sixers are slowly but surely starting to assemble the likes of a team that gives their fans some optimism after what feels like decades of losing. The Knicks found themselves as the only team to fall in the draft order as the envelops were opened at last night’s lottery. I hate to say this, but maybe the Knicks wouldn’t be in this position (literally) if they hadn’t won three of their last six games, including two games against teams in the top-5 of the lottery (Philadelphia and Orlando). As my Knick fan friends texted me last night as their dreams were being snatched away once again, “The Knicks can’t even lose right.” Unfortunately this means the second coming of Patrick Ewing will not be found in the draft this year, but it isn’t all bad. The Knicks are in an interesting spot at No. 4: they will get to decide between whichever point guard is left on the board (Russell/Mudiay), or they can go in an entirely different direction. The Knicks are known for trading draft picks, but I just hope this time around they don’t. New York does not have their own first round pick next year, thanks to the Melo and Andrea Bargnani trades, so this year’s draft becomes that much more important. Drafting a ready-to-play-now player lime Mudiay will really help give this team another leader on and off the floor, and in a weak Eastern Conference signing one free agent could mean the playoffs are in store for this team next season. Justice Winslow is a name to watch out for, but I would be surprised if the Knicks go against conventional wisdom simply because of the amount of criticism that would be headed their way. Adding a point guard in the draft and a big man like Greg Monroe (who is already rumored to be interested in coming to New York) to a healthy Carmelo could help quickly turn around this team. The Magic will round out the top 5 in this year’s draft, and also fit the description of a team drafting the best player available. This team quietly was playing some really good basketball at the end of the season last year and just needs to continue to develop the talent they have. Elfrid Payton was one of the best rookie point guards last season, Victor Oladipo continues to improve, and Nikola Vucevic is one of the most not-talked-about talented big man in the game. Throw in last year’s top pick and athletic freak Aaron Gordon plus whoever the team drafts this year and the Magic will have one of the best young nucleuses in the league. I like a forward here for Orlando depending on who is still on the board when it’s their turn to pick. Whether its a small forward, like Justice Winslow or a stretch four that can play next to Vucevic this team will have a real chance to make a playoff push next season. Imagine a defensive backcourt of Payton, Oladipo and Winslow for the next ten years? This team will have to decide if Winslow or if a more low post player who can shoot like Kristaps Porzingis from overseas is a better fit. Either way the Magic are setting themselves up to compete with in the Eastern Conference in the very near future. This entry was posted in Draft / Offseason, Home, NBA and tagged 2015 NBA Draft, 2015 NBA Draft Lottery, draft, Knicks, Kobe Bryant, Lakers, Los Angeles Lakers, Lottery, Magic, Magic Johnson, Minnesota Timberwolves, NBA Draft, New York Knicks, Orlando Magic, Philadelphia 76ers, Sixers, T-Wolves, Top-5 picks, Twolves. Bookmark the permalink.